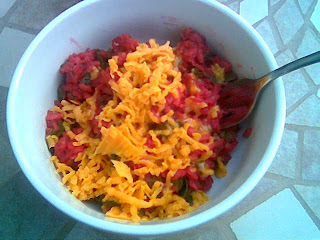 This evening my lovely wife made Beet Risotto with Colby Cheese. We're participating in a Farm Share this Summer, and as a result have a healthy quantity of beets. This suits me fine, as I'm fond of beets, but my wife only likes them if you can get rid of that "earthy, beety" flavor. In other words, if you make them taste like something other than beets. Unlike the grilled Beets she made earlier in the week, she showed no interest in the Risotto after the initial meal. Again, this suited me fine as it meant I could use the leftovers for lunch. She may not like it, but I, liking a good beet, found the meal delicious. Besides, a good Risotto can be so robust when reheated, and it's hard to beat the looks form coworkers when you walk down form the kitchen with a plate of a red substance covered in white or yellow cheese. It's an aesthetically pleasing meal, as well as tasty.